Retaining walls are a vital part of your landscape design, particularly if your yard is not perfectly flat. Retaining walls prevent healthy soil from eroding away, protecting your planted areas and the plants you have invested in. These walls can also be used to create pathways and add interest to your landscaped areas. With both aesthetic and functional purposes, a retaining wall is a true asset to many landscape designs. Vision Green offers a wide range of wooden, concrete and masonry retaining walls for our Charlotte area customers. When you partner with Vision Green for your retaining wall, you have several options to consider. We will help you decide on the best material to meet your aesthetic, budget and design needs. Poured concrete – Simple and durable, a poured concrete wall can be a functional addition to your garden. Conventional block walls -Manufactured masonry blocks can be stacked up to provide an attractive and durable wall option. Mortarless Concrete – Dry-stacked, mortarless concrete blocks fit together without the need for grout using interlocking tabs for a professional, yet simple to install design. Wooden retaining walls – Pressure-treated lumber can withstand years of outdoor use. Which option is best for your yard? The answer will depend on many factors, but we are here to help you make the right choice! Once you know the right material for your wall, trust Vision Green for professional retaining wall installation. 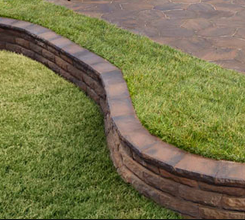 Our landscaping experts will craft a wall that will stand up for years. Professional installation limits the risk of premature failure of your wall, and also ensures that the design is in line with the design of the rest of your landscape. Contact Vision Green today to begin planning for your retaining wall design.